We groom pets… all day, every day. Gracious Grooming does it all. 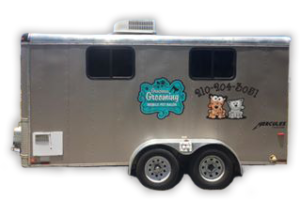 We’re a full service mobile pet groomer. There’s no breed that intimidates us. If you go for short fluffy types like the Bichon that has eyes for nobody but you, you’ve come to the right place. We also can take care of your rugged 120 lb German Shepherd who loves to dig, chew and shed like mad. We have no limits on size, breeds, or age: young or old, big or small, we love ’em all!